It is a common perception among Free software enthusiasts that AMD's acquisition of ATI bodes really good for Linux and Free software. This perception is bang on target because AMD has promised that it will be eventually providing open source drivers for all its graphics cards. Just yet, AMD/ATI has released Linux drivers for its popular range of graphics cards namely ATI Catalyst 7.10 graphics drivers. So what is so unique about the ATI Catalyst ? Well, ATI Catalyst is a unified software suite which delivers a full software solution for supported Microsoft Windows and Linux operating systems. 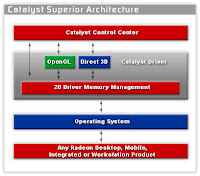 And AMD/ATI claims that all ATI products use the same Catalyst driver ensuring all products take advantage of the incredible performance, stability, innovative features, and visual quality that the Catalyst software suite have to offer. The latest version of ATI Catalyst is 7.10. It has support for AIGLX and ATI GPUs which translates to enhanced performance in playing 3D games such as Quake and Doom. If you own a ATI graphics card, you may download the driver suite for Linux from AMD's official website. Of course, this driver has not yet been released as open source and is as proprietary as the Nvidia drivers. But with AMD in charge, one can say with certainty that ATI has become a lot more Linux friendly than it was before its acquisition.